Thank you for visiting my website! I live in Warwickshire and write psychological, paranormal and mystery fiction for young adults and new adults. I’m also a public speaker, and I give author talks and creative writing workshops to groups. Please contact me if you’d like me to speak for your group. I give a one hour interactive talk on The Power of Story and The Highs and Lows of the Writing Life. If you’d like to book me to speak to your group, please call me on 07757 222918, or email me at scskillman@outlook.com. My first two novels for new adults, Mystical Circles and A Passionate Spirit are both set in the same mysterious English manor house in the heart of England – the beautiful Cotswold hills. Mystical Circles begins, and A Passionate Spirit continues, the story of the two sisters Juliet and Zoe. There in that mysterious manor house, gothic goings-on, paranormal events and ghostly tales are never far away. I’ve set these two books in contemporary times, not far from my present home. But my new upcoming young adult gothic series starring teen rebel and musical genius Dylan Raftery will be set in different English locations; so far, London and Oxford. I’ve just completed Director’s Cut and am currently working on the second in the series, Standing Ovation. I’ve also put together a self-help book for aspiring writers: Perilous Path, a writer’s journey Want to know how to write a novel? Or perhaps you’re writing a novel right now and could do with some encouragement, friendly tips and motivation to keep going. And while you’re after that, how about discovering more about some of your favourite writers, their lives and works? Inside this self-help book Perilous Path, you’ll find nuggets and insights about such famous authors as JRR Tolkien, Jane Austen and George Orwell as well as unexpected help from people as diverse as Carl Jung, Ernest Hemingway and David Hockney. And my upcoming book, Spirit of Warwickshire, is both a travel book and a spiritual book. It’s about our English heritage as revealed in the stories of Warwickshire’s most iconic locations. And it tells why these locations have deep spiritual resonance, not only for tourists, but also for those who seek to delve into the heart of English history. I was born and brought up in Orpington, Kent, and have loved writing stories most of my life; inspired by the adventure stories of Enid Blyton, I started writing adventure stories at the age of seven. I studied English Literature at Lancaster University, and my first permanent job was as a production secretary with the BBC. Later I lived for nearly five years in Australia before returning to the UK. I’ve now settled in Warwick with my husband David and son Jamie, and my daughter Abigail has chosen to follow in my footsteps by setting off for an adventure in Australia. Near my home may be found some of England’s most famous destinations: the Royal Shakespeare Theatre and the Shakespeare properties at Stratford-upon Avon, and the two great castles at Kenilworth and Warwick: all of them powerful places to visit, for someone seeking spiritual and historical inspiration. Here on my blog, I post weekly. I love to have your comments so please keep them coming! 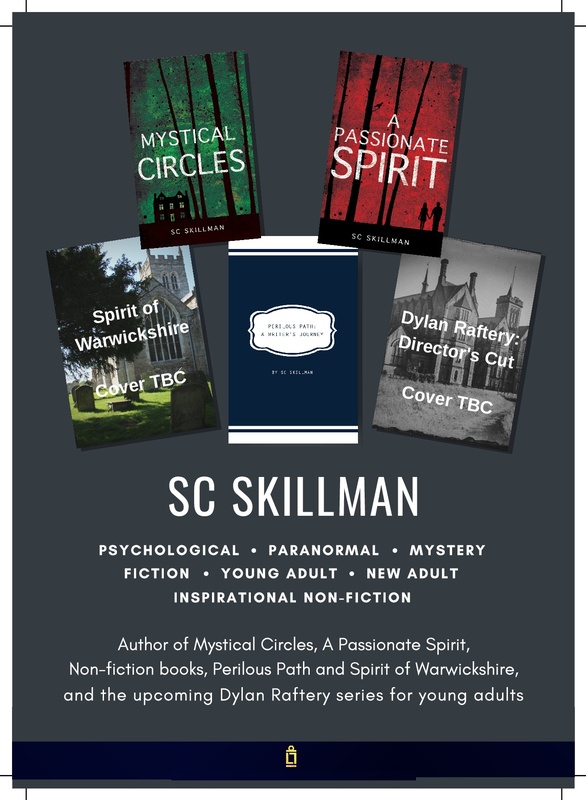 And if you’d like to know more about when my next three books will be out (Director’s Cut, Standing Ovation and Spirit of Warwickshire), do sign up for my mailing list here. I’ve always been fascinated by the interaction of different complex personalities, an inexhaustible source of inspiration for a writer! Thank you for reading this. And if you want to be first to hear about my new books, do sign up on my email list here.